Early intervention is critical for young children to ensure effective development in their early years. We often see generations of worklessness, poverty and neglect and often the parents simply don’t know how to break these destructive cycles. It is essential to educate and stimulate the children, otherwise these destructive cycles will continue. This is why it is important for Save the Family to not only work with the children, but also to work with the family as a whole, encouraging parents to engage with their children and develop better parenting skills. Children’s brains double in size in their first year and undergo a huge amount of change over the first three years of life. Neurons and synapses form the electrical system of the brain. A neuron is a network of specialised nerve cells that communicate with each other using electrical and chemical signals. A synapse is a point at which neurons connect and pass these signals (or messages) between them. These messages are important because they are the physical foundation of learning and memory. Research has shown that the synapses form at their fastest in the first three years than at any other time in life; in fact, a two year old could have almost twice as many synapses as a fully grown adult. Non-essential synapses are discarded by the brain as it develops over the years. A child responds to the environment around him (and his experiences) and this stimulates brain activity (and the formation of synapses), and therefore brain development and growth. If a child’s brain does not have this stimulation, it will not fully develop. This situation is irreversible. 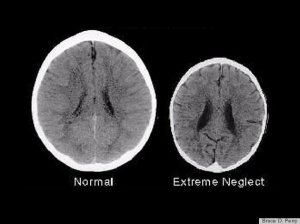 The image here shows the negative impact, on a developing brain, of neglect. The image shows two CT scans. The one on the left is of a normal, healthy three year old with an average head size (50th percentile). The image on the right is of a child who suffered severe sensory-deprivation neglect (3rd percentile). You can see that this child’s brain is significantly smaller than the healthy child’s brain. Perry, B.D. ; 2002: Childhood Experience and the Expression of Genetic Potential: What Childhood Neglect Tells Us About Nature and Nurture, in Brain and Mind 3, Kluwer Academic Publishers, Netherlands, pp. 92-94. Field, F. 2010, “The Foundation Years: preventing poor children becoming poor adults” HM Government, London.